Few people would willingly pitch themselves headfirst into a chicken cage, but Jane Howorth did so without hesitation. As founder of the British Hen Welfare Trust, Howorth gathers expired hens from commercial egg farms before they meet the slaughterhouse, and gives them an easy retirement in someone’s grassy back garden. Often, hen collections morph into rescue missions – like the time a bird became trapped behind its wire pen during a pick-up. “My vet was pushing me into the cage to catch it, and she informed me were not leaving until I got that hen,” Howorth says. When she finally rescued the troubled bird, Howorth was unceremoniously extracted from the cage and wheeled out on an egg trolley. This is the day-to-day reality facing those we might call “hen humanitarians”, who have made it their duty to re-home farm hens through adoption. Re-homing is now widespread in the United Kingdom, where backyard birds are commonplace, and it’s on the rise in the United States too. What drives it is the harsh fact that for most hens, egg production takes a dip after one year of laying, which cues farmers – who struggle globally with mounting economic pressures – to cut their losses and send aging chickens to slaughter. 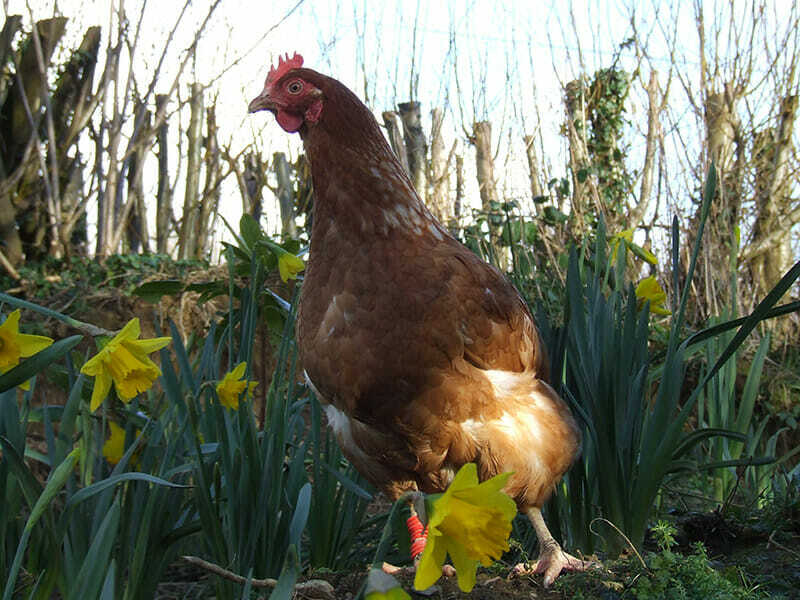 Howorth established the British Hen Welfare Trust in 2005 to try and give such birds a shot at free-range living. “Long term, I’d like to see every hen come outdoors,” she says. She hopes all egg farms might eventually turn free-range. 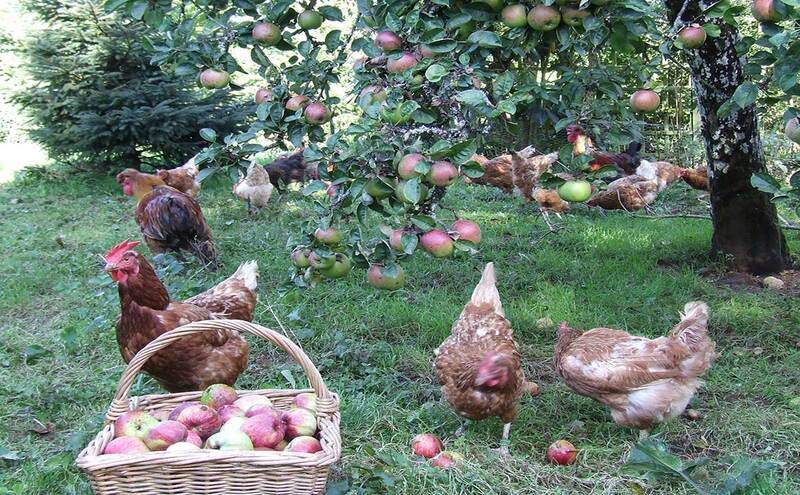 Retired hens enjoying a day at the orchard. The Trust has so far re-homed over 400,000 hens via 30 cross-country collection centers, and it aims to hit half a million adoptions by the end of 2015. Almost all the birds come from large-scale commercial farms, and the demand for such hens seems to indicate that Britons are beginning to see the appeal of saving commercial farm chickens over purchasing mail-order hens. In the U.S., the backyard hen trend is also catching on, and similar adoption schemes have been going for several years, nurtured by the slow-food movement and the rise of CSAs. In California, which annually churns out five billion eggs, two non-profits called Animal Place and Forget Me Not Farms recently made news when they partnered to rescue 1,800 birds that were orphaned after a nearby farm closed down. Forget Me Not Farms collects and adopts out about 50 birds at a time – and they’re popular. “We have a waitlist for 300 hens right now,” says Carol Rathmann, the farm’s executive director of children’s services, whose birds do double duty as therapy animals for abused and neglected children who come to the farm to visit the hens before they are adopted out. American non-profits still struggle with cautious farmers, however. According to Rathmann, factory farmers don’t want anyone to make a mental link between hens that are adopted out and the farms they originate from – so much so that when Animal Place collects hens, they do so in unmarked vans. Animal Place knows where the hens originate, but they don’t necessarily pass on that information. California’s Proposition 2 Law – legislation designed to make cages more humane, and considered controversial by some farmers – comes into effect in 2015. But in the UK, battery farms were banned in 2012. So, in a step-up from oppressively crushed cages, British chickens enjoy more space, a place to perch, a scratch pad, and a curtained enclosure behind which they can lay their eggs – something they prefer to do in private (thank you very much). Conditions are still crowded, but they are deemed more humane by authorities which may be why UK farmers feel more at ease working with groups like Howorth’s. But despite this improved scenario for commercially-farmed British hens, what drives Howorth to continue re-homing is that these chickens still often reach the end of their short lives having never seen the sun. It’s an experience she’d like to give to as many as she can. Whether British or American, hens aren’t just handed out to adoptive parents like prizes at a county fair. Whether British or American, hens aren’t just handed out to adoptive parents like prizes at a county fair, however. “We want to make sure they’re not going back to the same kind of situation,” says Rathmann. As with rescued pets, Howorth says they used to do home-visits with applicants, but now there are just too many birds. Instead, prospective hen-parents in the UK go through what Howorth jokes is “a bit like a military operation.” When the Trust advertises a new batch of hens, interested applicants are interviewed by phone, given a crash-course in hen-care, and required to show they have garden space, a chicken shelter, and time on their hands to dole out the love these birds will come to crave. When collection day arrives, successful applicants are issued a time slot, when they’re asked to arrive and queue at the collection center, bearing a ventilated, straw-filled box in which to carry their hens. Most birds will then be transported to modest suburban yards, while others will find themselves strutting about palatial grounds – quite literally. 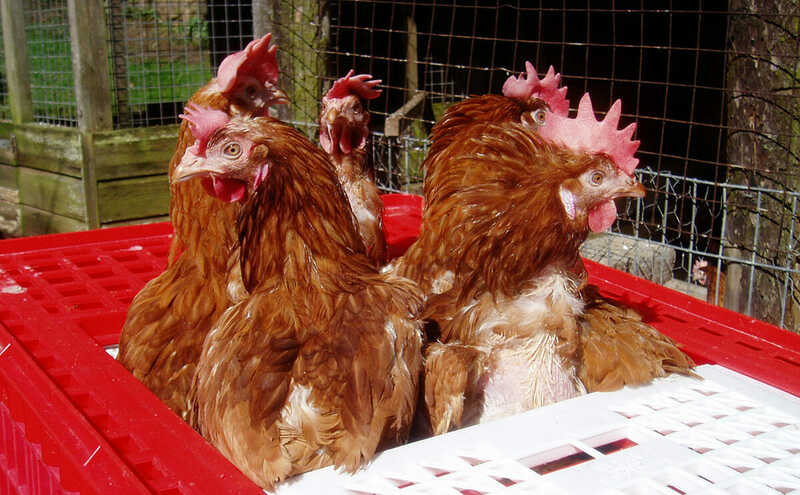 “They love sunshine just like we love sunshine” says British Hen Welfare Trust’s Jane Howorth. There are the occasional chance-takers, like one woman who arrived with a suitcase to sandwich her chickens into. “I said, ‘Not with my hens you don’t,’” Howorth recalls. And there’s even a bold – albeit small – contingent who ask if they can eat the birds they adopt; somewhat at odds with the notion of rescuing a hen that’s really just seeking a break from all that. “We’ve been asked three times max, and we’ll just say to people, you’ve got the wrong birds. These are just not designed to hold meat,” says Howorth. At Forget Me Not Farms, a $10 charge is affixed to every hen to act as a control. “Why would you pay that when you can get a barbecue chicken from Costco for less?” Rathmann points out. New parents, Howorth says, are soon besotted. One owner, Jane Elliott from Croydon in the UK, adopted two rangers from the Trust in January, named ‘Maisy’, and ‘Flora’. Both started laying right away, and now each clocks in a cool six eggs a week. Elliott bakes an awful lot to use up all of their produce. “Pavlovas,” she says, drily, referring to a meringue dessert that calls for several eggs. For hens accustomed to life in an indoor cage, a gargantuan green scratch pad must feel like an extended trip to Disneyland. For commercial hens accustomed to life in an indoor cage, being re-homed to a gargantuan green scratch pad with luxury accommodation must feel like an extended trip to Disneyland. Yet, re-homing isn’t approved by all. “There are a few within the industry that see me as a potential for spreading disease,” says Howorth. Hens are all farm-vaccinated though, and grow to be healthier than they might be inside a cage. Howorth’s continuing partnership with British farms, both large-scale commercial and smaller free-range, also speaks volumes about her successful approach. She’s a staunch supporter of the British egg industry and avoids berating farmers. It appears to be what keeps her relationships afloat. For such organizations, the overarching aim is to enlighten people. “Number one, it’s about saving hens’ lives, number two, giving them a better life, and number three, it’s about educating the public,” Rathmann says. Both use adoption as tool to expose people to the reality of commercial farming, while creating a new reality for hens. And if anyone needs convincing that a free-ranging hen is a happier hen, says Howorth, watch a small flock experiencing the outdoors. With their bellies to the earth and wings outspread, the birds will, quite literally, sunbathe.